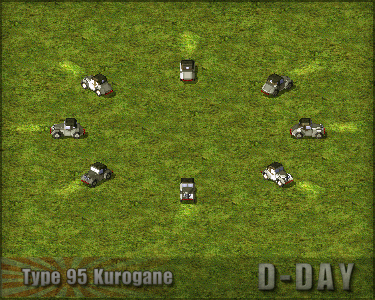 Today we reach a milestone in the road to D-day's next release, these three vehicles are the last of the Imperial Japanese ground units! While the largest part of the Japanese side is now complete there is still much left to do tho. The Type 95 Kurogane was a Japanese four wheel drive car designed in 1935 specificity for military use, up to that point the Japanese army had employed civilian vehicles for all its transport and utility roles. It was fitted with three seats, the space for the usual four seat in the rear was instead occupied by radio equipment allowing the Type 95 to perform scouting missions. Approximately 4,800 were built during the war and they served on all fronts, most were destroyed but a few have survived in Japanese an Russian museums. 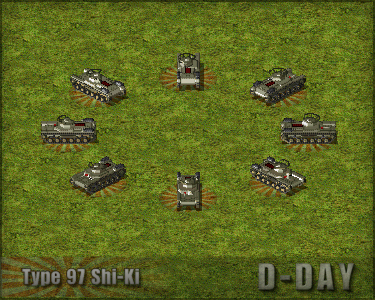 The Type 97 Shi-Ki was a modification of the Type 97 Chi-Ha converting it into a command tank. The main gun was removed from the turret and a large radio was put in its place, sometimes a dummy barrel was fitted to the turret to disguise it as a standard tank. The hull mounted machine gun was also replaced with a 37mm cannon giving it some limited offensive power against enemy armour. 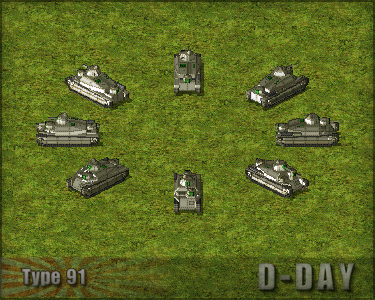 In D-day this tank provides a buff in speed and firepower to friendly units around it. The Type 91 was a further development of Japan's first indigenous tank design the Experimental Tank No.1. After several years of testing the project was cancelled and work moved on to the Type 95 tank.